Nobody wants to lose in court – especially when a case goes all the way to an appellate court. Wirth Law Office was disappointed when the Oklahoma Court of Civil Appeals ruled against us in a 2012 case where we tested the language of an expungment law. Fortunately, our loss turned out to be a win for some Oklahomans who want their arrest records sealed. As it turned out, we were not the only ones who did not like the court’s adverse ruling. Our effort brought a bad law to the attention of legislators, who have now changed the law. District 34 Representative Cory Williams (D-Stillwater) – an Oklahoma criminal defense attorney – had been working on expungement reforms through several legislative sessions. He introduced a bill that changed the law to mean what we had argued it should mean. The legislature agreed – the law should be changed. Because of the change, many Oklahomans who could not previously get their criminal records sealed may soon be eligible for expunction. At issue were expungement filings where a person was charged with more than one offense related to a single incident. Examples include when a person is charged with driving under the influence and driving with an expired tag, or possession of marijuana and possession of paraphernalia to smoke marijuana. The Oklahoma State Bureau of Investigations often objected to expungements in such cases. They said the law allows expungement only when a person has been convicted of a single one misdemeanor or non-violent felony – even if one incident lead to several related charges. Wirth Law Office argued that the language of the law barred expungement only when a person had been charged with subsequent offenses. We argued it is absurd to expunge records where someone is charged with possessing several ounces of heroin, but not expunge records when someone is arrested with an ounce of heroin and an ounce of cocaine at the same time. The court disagreed with us. As a criminal defense attorney, Williams was familiar with the courts’ published opinion in the case we argued. In conversations with another criminal defense attorney, Williams decided the law needed to be changed. Williams knew how to steer expungement reform bills through the legislature. He had previously worked with district attorney groups and legislators to carve out expungment reforms acceptable on both sides of the table. Expungement reform preferred by criminal defense attorneys might seem unlikely in Oklahoma, where conservative politics often translate to tough-on-crime legislation. 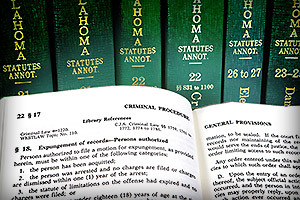 Sealing records of arrests and criminal convictions, however, provides people a way to reform their reputation and become economically productive. “These are things that can get people back to work,” Williams explained. The expungement bill Williams sponsored first passed the legislature only to be vetoed along with a slate of other bills. Gov. Mary Falin told reporters she vetoed 15 bills in on April 19, 2014 to send a message to the House of Representatives. She was unhappy that the legislature had not funded repairs to the state capital building, yet had passed bills she considered to address minor issues. Legislators quickly reintroduced the bill. The bill sailed through the Oklahoma Senate with a 45-2 vote then passed the House in a 62-17 vote. Fallin signed the expungement bill into law May 28, 2014. The revised Oklahoma expungement law takes effect Nov. 1, 2014. If you have previously been refused expungement in Oklahoma, or have been told you are not eligible to have your arrest records and court records sealed, you might be eligible for expungment under the new law. To find out, contact a Oklahoma expungment attorney at Wirth Law Office. For a free consultation with a Tulsa expungement lawyer, call (918) 879-1681. You can also send us a written question using the form at the top of this page.